Most of us were surprised to wake up to this news today. I stand fairly alone in my family and circle of friends (actually even in my own house) when I say anything good about President Obama, so I tend not to say much, but today is different – I’m going to voice my thoughts on this. I don’t think Obama is Jesus (or a ‘savior’) but I also don’t think he is the anti-Christ. I find President Obama to be like other people in the world – whether they are people I know well or not. I agree with some of what they say/do, but can’t believe some other things they say/do. That’s how I feel about President Obama – I agree with some of what he says and does, but not everything. I don’t cry easily, but I cried when he was elected. I was moved by the major step it was for him, his family and our country. I’ve been thrilled with some of the decisions he’s made and sad with some others. But mostly I wait … I wait to see what the next few years hold. I give him the benefit of the doubt at this time on his many initiatives, plans and programs. Good things take time. That sounds like it should be given for achievements already done, not in the process. He’s taken some major steps in bringing people together and promoting peace – but he’s not even in the middle of his presidency yet! I think it is a premature award and I hope it doesn’t take time and energy away from the work he needs to do. And I hope that someday he will accomplish many of his goals and then his prize will be even better than a medal – it will be the fact that more people live in peace because of his achievements. 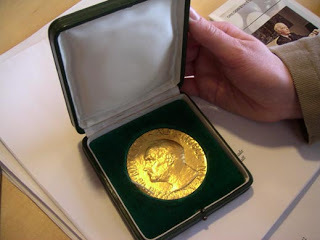 Should he or shouldn’t he have won the Nobel Peace Prize? I heard on the noon news that the deadline for nominations for this award was just 2 weeks after Obama was sworn in. I would agree that this was awarded WAY prematurely. The president has done NOTHING to deserve this award. He has not brought together warring factions. He has not brokered any peace agreements. We are still at war in Iraq and Afghanistan. There is no way he should get this award and it is more about fawning over him and making a statement against the Bush administration than anything else. President Obama should have declined the award; he does not deserve it one bit. We all seem to share the same thought – that's its a premature award. Wonder what the committee of five that voted was thinking? As for him accepting it – whether he did or didn't – not sure there was a 'right' thing for him to do. Either way, a large group of people would be disappointed and wish he had done the other. The committee was probably thinking they'd like to advance their political views, plain and simple.